This is a 'live' course. This course: Oct. 3-4, 2019 in Bellevue, WA. This course is not sponsored by a real estate company. All are welcome to attend! Bonus: Get innovative training methods from the only National Association of Realtors' Realtor Educator of the Year in Washington State (and also a Washington Realtor Educator of the Year). Bonus #2: Attendees receive 30% off 3 of Carla's training resources. You want to teach well; why not learn from the best? Carla Cross has been presenting and performing since she was four years old. She’s been teaching real estate courses for 20 years internationally, and has been coached, too, by the best. (She’s a member of National Speakers’ Association, to keep learning new presentation techniques). 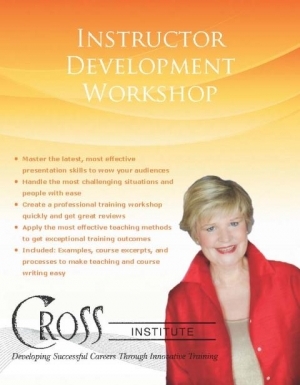 She’ll offer you a completely different and extremely valuable experience in her Instructor Development Workshop. Materials: Includes a 90+ page desktop published handbook, a complete resource guide for creating course material and planning presentations. This resource includes dozens of examples of outlines, teaching tools, and ready-to-use documents to create courses effectively. Bonus: Attendees also receive #0% discount on 3 of Carla's training resources. Tuition: $249, which includes the 90 page full ‘how to train’ resource (early enrollment). See enrollment information about cut-off dates for early and late enrollment. Customization: Does your association or company need specific training methods or presentation skills? Carla customizes this course content to meet your needs. Carla contracts with associations and title and mortgage companies to do Instructor Development Workshop specifically for them. Call 425-392-6914 for more information. Great job! Enjoyable and challenging. The best thing I got from the workshop is what is needed for a good training workshop. Carolyn Mackay, Real Estate 2000 Corp. Wonderful presentation and content and very practical application so we can apply skills. Melody Cahill, Exit Northwest Realty, Olympia, Wa. Can’t get away to take a ‘live’ Instructor Development course?